Knopf Books for Young Readers, 9780385755030, 40pp. 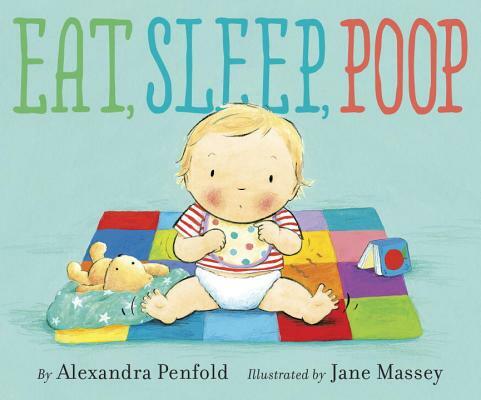 A hilarious book about the busy life of newborns—an Eat, Pray, Love for the pre-verbal set (and their parents)! Alexandra Penfold has been working in publishing for over a decade as a children’s book editor and as an agent. She’s the co-author of New York a la Cart: Recipes and Stories from the Big Apple’s Best Food Trucks, and makes her picture-book debut with Eat, Sleep, Poop. Alexandra lives with her family in Brooklyn, New York. Jane Massey studied graphic design at Kingston University and worked for design agencies in London and Hong Kong. She is also known for her illustration work on packaging, advertising, and greeting cards. She lives on the southern coast of England with her family.